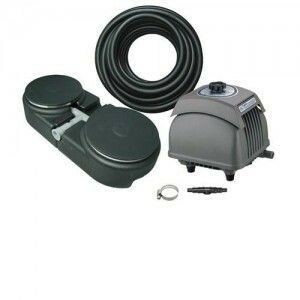 Matala EZ-Air Pro Kits offer you a reliable and economical pond aeration system with professional components. The MEA Pro Kits are the best solution for breathing life into ponds up to 10 feet deep. The Matala HK air pumps are industrial grade and designed to give maximum performance. The Plus Kits utilize the award winning MDB Diffuser with weighted base and high quality EPDM Disc Diffuser. Weighted air hose and connectors all included to make pond aeration EZ. Available for shallow ponds from 1,000 gallons to 45,000 gallons. The EZ Air Kits are complete packages ready for EZ installation. Each kit comes complete with Matala Air Pump, Air Diffusers, Sinking Air Hose and all connectors. We take all the guesswork out of aerating your spond. The MEA Pro 5 Plus Kit includes:Matala HK80L Air Pump. •-Air flow up to 100 lpm or 3.5 cfm. •-Suggested water depth up to 10 feet. •-For Ponds between 10,000 to 24,000 gallons.MDB22 Weighted Base with two 9 inch Disc Diffusers. •-A total of two 9 inch EPDM Disc Diffuser. •-Lowest back pressure diffuser on the market for maximum air flow and longest life for the air pump. •-Self Cleaning, no maintenance required. Very long lifetime. •-Weighted Base is fish friendly. Double Base supports two 9 inch disc diffusers. •-30 feet high quality 3/8" weighted hose. •-Will not kink or crush.